Seeds or plays on table. Your cards may seed and play (one per turn). 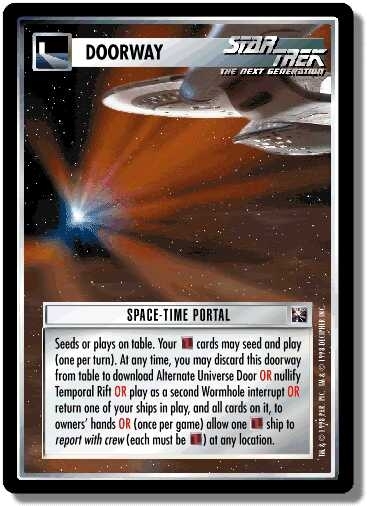 At any time, you may discard this doorway from table to download Alternate Universe Door OR nullify Temporal Rift OR plays as second Wormhole interrupt OR return one of your ships in play, and all cards on it, to owners' hand OR (once per game) allow one ship to report with crew (each must be ) at any location. This doorway allows you to seed dilemmas, artifacts, or other seed cards. It does not allow seeding of cards that are not normally seedable, such as personnel or ships (unless another card makes them seedable, such as Cryosatellite). See Alternate Universe icon. It allows you to play only one card per turn, even if you have multiple Space-Time Portals in play (see once per turn). Its text does not restrict a seeded Alternate Universe Door, which allows you to play multiple cards each turn (e.g., interrupts, doorways, or multiple card plays allowed by a card such as Red Alert!). Because this doorway allows you to seed or play only one card per turn, you may seed only one card under Q's Planet, and only if you have not already played an card that turn. You may discard the doorway from the table “at any time” for any one of its functions – during either player’s turn, before or after your card play or executing orders, between other actions or as a valid response to an action. It is not a valid response to the initiation of a battle or the encounter of a dilemma; thus, you may not escape from battle or a dilemma encounter by returning a ship to your hand. See actions - interrupting, actions - step 2: responses. An Alternate Universe Door may be downloaded only for one of the “play” functions of that doorway; it may not be downloaded “onto the table.” A Space-Time Portal discarded to “play as a second Wormhole interrupt” may be nullified by Amanda Rogers. It is still a Doorway card, and may be closed (if the Wormholes are kept open with Operate Wormhole Relays). See card types. There are 43 entries for Space-Time Portal (ST1E 0 P 38) at the Tradeplace (101 haves and 6 wants). Click here to see all trade list entries for this Promotion card! Also see here for all trade lists with any card fom "Official Tournament Sealed Deck".